The Cxcr4 genotype rank order for peripheral blood reconstitution after competitive BM transplantation in lethally irradiated mice is Cxcr4+/o, which is greater than Cxcr4+/+, which is greater than Cxcr4+/w. 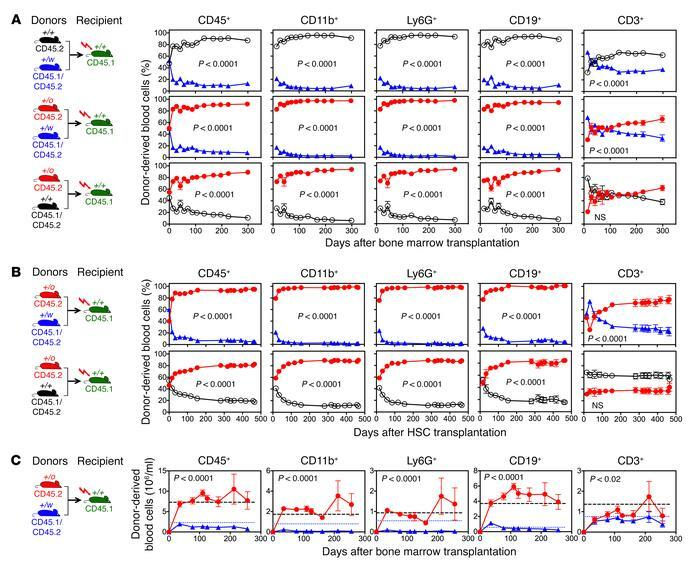 (A and B) Donor-derived leukocyte frequencies after transplantation with total BM cells (A) or FACS-purified Lin–Sca-1+c-Kit+CD48–CD34–CD150+ HSCs (B). Experiment design is shown on the left of each row of graphs. Data are the percentage (mean ± SEM) of total donor-derived cells for each subset indicated. See Supplemental Figure 1, A and B, for representative flow cytometry plots and transplantation conditions. (C) Donor-derived absolute leukocyte counts after competitive BM transplantation. Experiment design is shown on the left. Data are absolute numbers of donor-derived cells per milliliter (mean ± SEM) of the subset indicated. The average absolute blood counts of naive Cxcr4+/+ (black dashed lines, n = 58) and Cxcr4+/w (blue dotted lines, n = 38) mice from our colony are also presented. Each recipient was transplanted with 5 million BM cells (A and C) or 2,000 HSCs (B). For all conditions, n was at least 5 mice. SEM was less than 5% of the mean at all time points lacking visible error bars. Results were verified in 3 additional independent experiments for A. +/o, +/+, and +/w denote Cxcr4+/o, Cxcr4+/+, and Cxcr4+/w donors, respectively. P values, 2-way ANOVA.